Spain’s Supreme Court has rejected the presence of international observers in the courtroom during the trial against Catalan independence leaders, as requested by the defendants, who fear they will not face a fair trial. 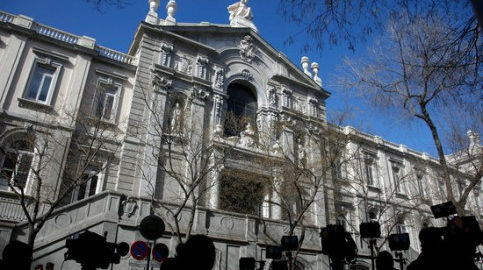 Several groups requested to be present in the courtroom during the independence trial, including Amnesty International and members of the European Parliament. The Supreme Court has dismissed the request from the defense teams, arguing that the trial will be broadcasted live: “Any citizen wishing to be an observer will be able to.” The original request was for five places. The court will allow two relatives of each defendant to be present in the courtroom. The trial against the 2017 referendum and declaration of independence will start on February 12. Twelve pro-independence leaders –nine of which in pre-trial jail– will face Spain’s Supreme Court in Madrid from that day. Nine of the officials to be tried are facing charges of violent rebellion, including the former Catalan vice president, some former ministers, the former parliament speaker and two grassroots leaders. All the former government members are also facing misuse of funds allegations. The public prosecutor has requested prison sentences of up to 25 years for each of them, and the joined sentences total 177 years. The Supreme Court has also decided that Spain’s former president, Mariano Rajoy, will have to speak before the court as a witness, thus accepting the defenses’ request. His former deputy president, Soraya Sáenz de Santamaría, will also have to attend the trial, as well as Spain’s former finance minister, Cristóbal Montoro, all three members of the People’s Party. The former Catalan president Artur Mas, Barcelona’s current mayor Ada Colau, and the Catalan parliament speaker, Roger Torrent, will also be witnesses, along with the Basque president, Íñigo Urkullu. Yet, the Supreme Court will not call Spain’s King Felipe as a witness, as some defendants had requested, and it also vetoed the exiled pro-independence leaders, Carles Puigdemont and Marta Rovira. Helena Catt, head of the International Election Expert Research Team, and Paul Sinning, director of the Hague Centre for Strategic Studies, who were in Catalonia during the 2017 independence referendum, have also been called as witnesses.